Qantas is Australia’s largest airline and the oldest continuously operating airline in the world. The Emirates and Qantas partnership offers a seamless travel experience across one of the world’s largest networks. Book nowBook now with QantasOpens an external website in a new tab. Earn and redeem Skywards Miles when you fly with Qantas. Please quote your membership number when making your booking and show your Emirates Skywards card when you check in. Take AdvantageTake advantage of the offers from QantasOpens an external website in a new tab. You can earn the following Skywards Miles on Qantas flights* with a QF flight number, including any domestic flights* if taken as part of a continuous international journey. 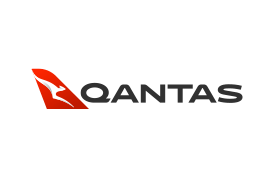 Please note that Skywards Miles will be awarded on Qantas operated flights and QantasLink scheduled services only, and will not be earned on codeshare flights. You can use your Skywards Miles to book reward flights across the Qantas network using our Plan & Book online facility. Skywards Miles can only be redeemed for reward bookings on Qantas operated flights with a QF flight number. The number of Miles you need for a Qantas reward flight is based on the distance travelled. Please refer to the table below for Miles required for return flight rewards. To calculate one-way flight rewards, just halve the Miles required. You will earn Tier Miles on Qantas-operated flights with an EK flight number. Tier Miles will not be available on any flights with a QF flight number. ** Journey distance includes domestic connecting flights. First Class is not available on all routes. A single stopover is permitted per itinerary. Upon completion of outbound travel a maximum stay of three months applies. The number of seats available for reward travel may be limited. Children travelling on reward tickets will be required to redeem the same amount of Miles as an adult. Infants must be at least two weeks old to travel. On international flights, infants aged between two weeks and two years will be charged 10% of the adult reward fare. There is no charge for infants on Qantas domestic flights. Miles stated are for direct flights only. Where no direct service is operated two or more rewards may be required. Qantas flights must be confirmed at the time of Miles redemption. Waitlists are not permitted. Reward tickets are valid for 12 months from date of issue. Date changes are permitted. A fee of USD 25 applies. For flight and/or date changes prior to departure, please contact Emirates Skywards. Refunds on fully unused tickets are permitted at a charge of USD 75. Expired Miles will not be reinstated. Additional taxes and surcharges payable with cash are not included.